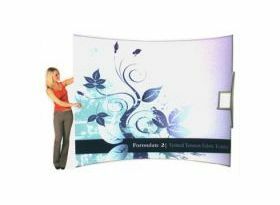 Available in vertical or horizontally curved versions, tension fabric displays are very light weight, easy to set-up and have a modern cutting-edge appearance. The fabric material is slightly stretchy, so it stays taught and forms to the frame using Velcro at key areas. Comes with a molded case for easy transport. Optional tabletop and literature holders (9"W x 12"H x 1"D) available. Pricing includes your full color graphic imaged to fabric using dye sublimation technology for the most brilliant colors on fabric available!